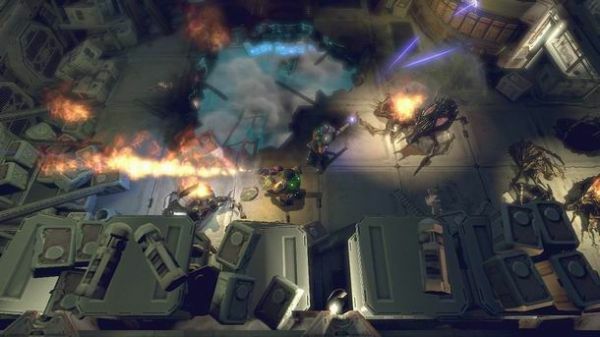 Upcoming top-down Alien co-op title Alien Breed Evolution has been confirmed to be released episodically in three installments, instead of being the first of a separate trilogy as previously believed. It's said that each of these three episodes will take players 5-8 hours to complete, and will be available for download "December-ish." If you're unsure about paying for 3 separate installments of the game, don't fret - the prologue will be available for download and preview for free. John Dennis of Team 17 discussed this decision with Eurogamer.net. From this, we got an idea of the sheer size of this game and why it may need to be released as episodes instead of one pretty package. "In each episode there's a prologue level, then there are five single-player levels and they're really large... Much larger than they should have been. There are also two set pieces in each episode. For example there's one where the ship goes through an asteroid field, there's debris coming up through the floor and the air's running out... There are also two boss battles in each episode, then on top of that there are three multiplayer levels." Alien Breed Evolution will be an Xbox LIVE Arcade and Playstation Network title available soon. No exact date has been set just yet, but we'll be sure to keep you posted.